The Dept of Labor BLS report for January, 2014 identified that the U.S. economy added 113,000 jobs in January, The nation's unemployment rate was 6.6 percent. "We learned this week that the Obama Administration views a shrinking workforce participation as a good thing based upon their response to Congressional Budget Office analysis of Obamacare which asserts that more than 2 million people are likely to leave the full-time workforce due to Obamacare. "The ups and downs of any monthly unemployment report pale in comparison to this startling analysis. While the labor participation rate shifted upward slightly, it still remains that 3.5 million fewer people who are 16-54 are participating in the workforce compared to January 2009 levels. If they were included in today's jobs report, the unemployment rate would be 8.6 percent, instead of the reported 6.6 percent. The declining labor force participation rate has created an additional 1.922 million young adults that are not counted as “unemployed” by the U.S. Department of Labor because they are not in the labor force, meaning that those young people have given up looking for work due to the lack of jobs. The effective (U-6) unemployment rate for 18-29 year old African-Americans is 23.9 percent (NSA); the (U-3) unemployment rate is 20.1 percent (NSA). The effective (U-6) unemployment rate for 18-29 year old Hispanics is 16.7 percent (NSA); the (U-3) unemployment rate is 12.2 percent (NSA). The effective (U-6) unemployment rate for 18-29 year old women is 13.5 percent (NSA); the (U-3) unemployment rate is 9.9 percent (NSA). 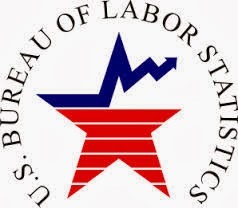 Tags: BLS, unemployment rate, below normal, To share or post to your site, click on "Post Link". Please mention / link to the ARRA News Service. and "Like" Facebook Page - Thanks! 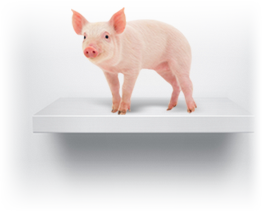 (Washington, D.C.) – Citizens Against Government Waste (CAGW) announced the results of its online poll for the 2013 Porker of the Year. Rep. Earl Blumenauer (D-OR) won with 25 percent of the vote while House Minority Whip Steny Hoyer (D-MD) placed a close second with 23 percent. The neck-and-neck race epitomizes the widespread dissatisfaction with Congress that has been shown in poll after poll. Taxpayers are appalled by the isolation and detachment of most members of Congress and their misreading of the gnawing economic problems facing the country, as well as individual members’ obsession with spending taxpayer money on parochial, self-interested side-show projects. 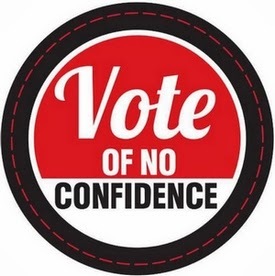 Tags: Citizens Against Government Waste, CAGW, Rep. Earl Blumenauer, Democrat, Oregon, 2013, Porker of the Year, increase federal gas tax, House Democratic Whip, Rep. Steny Hoyer, Democrat, Maryland, close second To share or post to your site, click on "Post Link". Please mention / link to the ARRA News Service. and "Like" Facebook Page - Thanks! Tim Phillips, President, Americans for Prosperity: In case you missed it, the Congressional Budget Office released a new report this week stating that the Affordable Care Act will cost the country the equivalent of 2.3 million full-time jobs and increase the deficit by $1 trillion over the next ten years. Believe it or not, the Obama administration is spinning this as a good thing. In reality, stripping millions of hours of productivity and rewarding people for working less will be detrimental to our economic growth. Check out my USA Today column to find out why the CBO's findings on ObamaCare are bad news for all Americans. We're working harder than ever to make sure Americans know the truth about ObamaCare. Thank you for joining us in the fight for health care freedom. Tags: Americans for Prosperity, new ad, Taapped by Obamacare To share or post to your site, click on "Post Link". Please mention / link to the ARRA News Service. and "Like" Facebook Page - Thanks! 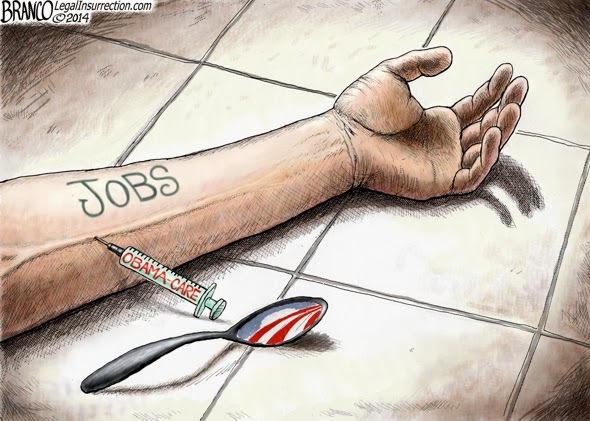 Tags: Obamacare, kills jobs, jobs, AF Branco, editorial cartoon To share or post to your site, click on "Post Link". Please mention / link to the ARRA News Service. and "Like" Facebook Page - Thanks! 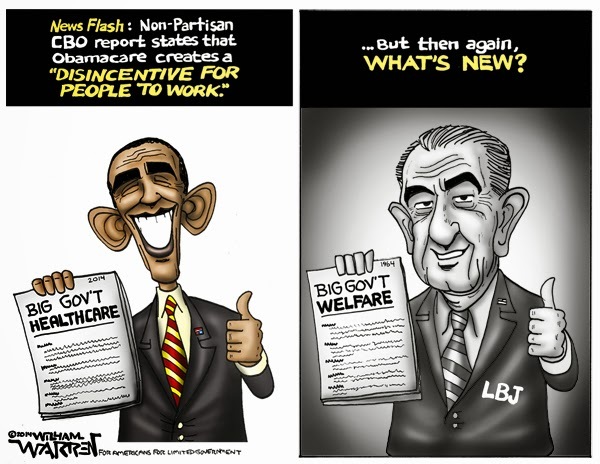 Tags: What's New, disincentive for work, Lyndon Johnson, LBR, Big Government Welfare, Big Government Healthcare, Barack Obama, William Warren, editorial cartoon To share or post to your site, click on "Post Link". Please mention / link to the ARRA News Service. and "Like" Facebook Page - Thanks! by Bill Smith: While there could be numerous possibilities for "whom progressive democrats hate," it appears that the answer in regard to the "whom do they hate the most" is reserved for former democrats who became conservative, constitutional liberty minded Republicans. It also seems that the roots of the KKK, founded by democrats, still runs deep in the bowels of the democratic party. A few names of black conservatives who have experienced vitriol by democrats in their past are Supreme Court Justice Clarence Thomas, former UN Ambassador, former HUD Undersecretary and conservative writer J. Ken Blackwell, former welfare mom and conservative spokesperson Star Parker, retired Lt. Col and former U.S. Representative Allen West (R-FL), former OU Quarterback and former U.S. Representative J.C. Watts (R-OK), conservative speaker, radio show host and former candidate for the Republican presidential nomination Herman Cain, and current U.S Senator Tim Scott (R-SC). While the these individuals are not discussed below, They were mentioned because their experiences shed light on the democrat reactions to the recent report on the IRS by the Treasury Inspector General for Tax Administration. Today, the Washington Post reported that "Two House Democrats on Thursday called for an investigation of a federal auditor who accused the Internal Revenue Service of gross mismanagement and targeting advocacy groups for extra scrutiny based on their names and policy positions. Reps. Gerry Connolly (D-VA) and Matt Cartwright (D-PN.) on Wednesday filed a complaint with a special watchdog council questioning the independence of Treasury Department inspector general J. Russell George. "The congressmen, both of whom serve as top Democrats on House oversight committees, said George produced a “fundamentally flawed performance audit” that was “incomplete” and “outright misleading.” They also alleged that he held briefings with Republican members of the House Oversight Committee without the knowledge of Democrats on the panel. . . .
"The inspector general’s report, released in May, said the IRS “used inappropriate criteria that identified for review Tea Party and other organizations applying for tax-exempt status.” Earlier that month, then-IRS official Lois Lerner alluded to the findings when she acknowledged in response to a planted question that the agency had targeted groups with “tea party” and “patriot” in their names." Obviously, the two House Democrats on the Oversight Committee are not happy with the report of the Inspector Generals office and are determined to tarnish the inspector general by using words like "outright misleading." This tempest in the teapot is also stirred by House Oversight Committee member Rep. Elijah Cummings (D-MD). It is indeed interesting that the Obama administration has "moved on" and directed the "Treasury Department to draft a new guideline to distinguish what types of political activities disqualify groups from tax-exempt status." This means that they are proposing IRS Rules that codify the actions and procedures which have already been found to be offensive to freedom of speech, and potentially unconstitutional. Also, note that President Obama has failed to nominate individuals for l various other government agencies Inspector General positions. 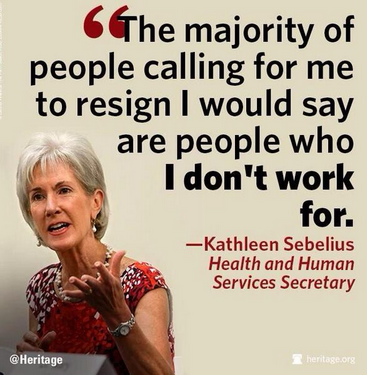 The people would have been providing audit reports to their agency and to Congress. Who is Treasury Inspector General J. Russell George? of importance to this article, he was a Democrat who became a Republican. Also, Mr. George is a conservative black Republican serving in the Obama administration and he is protected by his appointment as an inspector general. In a July, 2013 the Washington Post reported, that "Treasury inspector general J. Russell George . . . [was] a Democrat before becoming a Republican. "The IRS watchdog, a former staffer for Sen. Bob Dole who was appointed to his current position by President George W. Bush, told the House Oversight committee that he was a page for the 1980 Democratic National Convention and that he was a founder of the Howard University College Democrats during his time at the school. 'I saw the light and joined Bob Dole’s staff during college,' George said. "David Hayes, one of George’s classmates at Howard University who now clerks for a federal judge in Buffalo, confirmed in an interview with the Washington Post that George helped found the Democratic club." 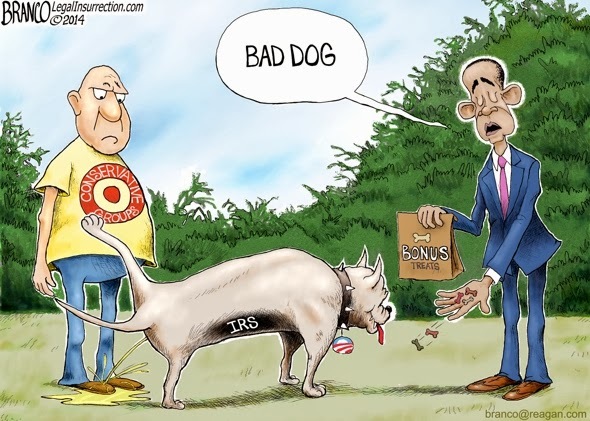 It is quite obvious that the Obama administration is not happy about the facts uncovered at the Internal Revenue Service and reported by the IG. Instead of acknowledging the problem and committing to correcting the situation, they opt to attack both the report and the messenger. And, based on the history of the democratic party, their vitriol and contempt is increased by the fact that J. Russell George is a black conservative who left the Democrat Party to become a Republican. 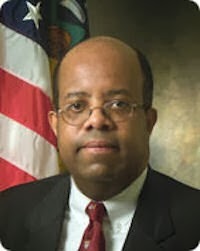 I salute Mr. J. Russell George for doing right by his position and authority to report on what happened at the IRS regarding denial of tax exemption status to conservative organizations and other issues.. Also, it is long overdue for Democrats to stop their extreme prejudice against blacks who leave the Democrat Party. Bill Smith is editor of the ARRA News Service - Historical note: It was the Republican Party that opposed slavery and wrote both civil rights bills which were opposed by democrats. Tags: democrats, progressives, hate, former democrats, black Republicans, IRS scandal, IG Report. 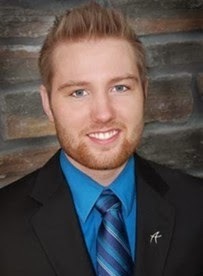 J. Russell George To share or post to your site, click on "Post Link". Please mention / link to the ARRA News Service. and "Like" Facebook Page - Thanks! by Daniel Horowitz, Madison Project: In a sane world, President Obama and the Democrats would be on the hook for requesting yet another debt ceiling increase after already racking up record high amounts of debt. Obama is extremely unpopular, saddled with the failures of Obamacare, and accruing more debt than every other president combined. Yet, thanks to self-immolation on the part of the stupid party, it is Republicans who find themselves getting trapped by their own leverage point. President Bush was a big spender and conducted two major wars during his eight years in office. When Bush was sworn in on January 20, 2001, the gross federal debt stood at $5.728 trillion. On January 20, 2009, the day he left office, the debt had increased to $10.629 trillion, a jump of $4.9 trillion. Just five years later, the gross federal debt stands at a whopping $17.263 trillion. Obama has amassed $6.63 trillion in debt. It took from our nation’s founding until July 2003 for us to achieve that milestone! Roughly $6 trillion of the Obama debt increase is comprised of the public share (not intra-governmental holdings), which now stands at $12.305 trillion. It took from our nation’s founding until October 2008 to amass that much in public debt. Now take a step back and cogitate the past statements from the President – prior to his unprecedented expansion of the national debt. Let that seep in for a moment. Now add another $6.63 trillion over five years into the mix. The debt ceiling, even more than a budget CR, can be messaged in plain language to the average voter. Any responsible person understands that we should not reflexively raise the debt ceiling, eschewing the only tool to force a balanced budget, until we formulate a plan to end the cycle of debt. And what will happen during the transition phase while we are debating a balanced budget? Will we default? Once again, let’s review the math of the federal budget. According to the updated budget projection from the CBO, the Treasury is slated to take in $3.029 trillion in revenue this year. Interest on the debt will cost $233 billion, a mere 7.7% of the massive tax revenue stolen from the private economy. Once that is paid off, there is no default. Period. Anyone who claims we will default is knowingly misleading the public. Those expenditures account for roughly $2.3 trillion. 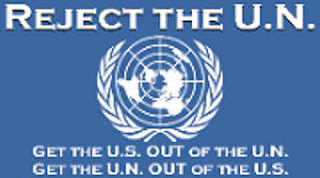 The remaining half trillion can be prioritized as needed for other functions related to homeland security, national parks, or any other limited function. And remember, these numbers are extrapolated over a 12-month time frame. The Treasury would have more flexibility to shift payments for vital services on a week-by-week basis as we work to responsibly downsize the rest of the federal government. Hence, the debt ceiling is a built-in balanced budget mechanism. Democrats can’t have it both ways. They imposed massive taxation, which has engendered enough revenue to cover the vital functions of government plus all of the entitlements. They can’t tax and borrow. Much like they claimed Obamacare is the law of the land, the debt ceiling is also the law of the land. We already tax; we already borrow. It’s time to force a long-term balanced budget. Sadly, Democrats can and will have it both ways. Instead of calling out Obama for his debt ceiling mendacity and publicly debunking his irresponsible lie about default, they obsequiously parrot his talking points. Well, after telegraphing that message to the Democrats for so long, there is not much we can do. At this point, all we can do is defeat these undocumented Democrats in primaries and elect a new cadre of conservative fighters in the primaries – fighters who will telegraph a very different message to our opponents. Daniel Horowitz is the policy director for the Madison Project. An expert on conservative policy and the legislative process. 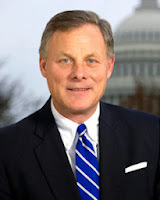 His concise and timely blogs are read all over the web and in the halls of Congress. Daniel is a frequent guest on talk radio shows throughout the country. Tags: GOP, Debt Ceiling Strategy, To share or post to your site, click on "Post Link". Please mention / link to the ARRA News Service. and "Like" Facebook Page - Thanks! 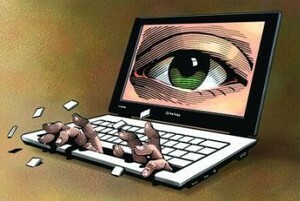 by Phil Kerpen, Contributing Author: The IRS confessed to targeting conservative groups in a stunning abuse of power. The IRS now proposes not to rectify its own misbehavior, but to blame the victims and codify its own misdeeds by adopting draconian limitations on the free speech rights of 501(c)4 social welfare groups. The IRS is required by law to consider public comments before they can go final with their new rules designed to hamstring 501(c)4 groups and undermine our rights of free speech and free association. If they fail to address your comments, the rules can be overturned in court! Your comments below will be submitted to the IRS. 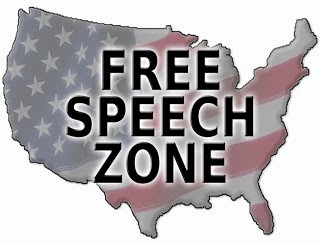 Click Here - Tell the IRS: "Stop trying to gut the First Amendment!" Phil Kerpen is president of American Commitment He is on Twitter and on Facebook . Kerpen is the author of Democracy Denied: How Obama is Bypassing Congress to Radically Transform America – and How to Stop Him and is a contributing author for the ARRA News Service. Tags: IRS, proposed rul, silence conservatives, threat to others, 501(c)4, Phil Kerpen, American Solutions To share or post to your site, click on "Post Link". Please mention / link to the ARRA News Service. and "Like" Facebook Page - Thanks! The Senate reconvened at 9:30 AM today and resumed consideration of S. 1845, the unemployment insurance extension bill. When Senate Majority Leader Harry Reid brought the unemployment insurance bill back to the floor earlier this week, he immediately filled the amendment tree, to block Republicans from offering or voting on any amendments. He then filed cloture to cut off debate on the legislation. At 2 PM, the Senate will vote on cloture (to cut off debate and move to a final vote) on the Reed amendment to S. 1845, which contains Democrats’ latest unemployment insurance extension plan. If cloture is not invoked (fails to get 60 votes) on the Reed amendment, the Senate will vote on cloture on the underlying bill. If neither cloture vote succeeds, the Senate is expected to vote on confirmation of the nomination of Sen. Max Baucus (D-MT) to be ambassador to China. The House reconvened at 9 AM and adjourned at 12:59 PM. The House considered and passed H.R. 2954 (220-194) — "To authorize Escambia County, Florida, to convey certain property that was formerly part of Santa Rosa Island National Monument and that was conveyed to Escambia County subject to restrictions on use and reconveyance." H.R. 3964 (229-191) - to address certain water-related concerns in the Sacramento-San Joaquin Valley, and for other purposes." Speaker Boehner commented on passage of this California water measure, "The situation for many in the Central Valley is dire, as a lack of rain is intensified by a federally-mandated drought reinforced by endless environmental lawsuits." H.R. 3590 (268-154) - to protect and enhance opportunities for recreational hunting, fishing, and shooting, and for other purposes." Boehner noted, "Today a bipartisan majority of the House affirmed that fishing, hunting, and shooting are important, traditional activities that should continue on America’s public lands." Potential end to the "doc fix" may be at hand. Today, House Ways and Means Committee Chairman Dave Camp (R-MI), Senate Finance Committee Chairman Max Baucus (D-MT), Senate Finance Committee Ranking Member Orrin Hatch (R-UT), House Ways and Means Committee Ranking Member Sander Levin (D-MI), House Energy and Commerce Committee Chairman Fred Upton (R-MI) and House Energy and Commerce Committee Ranking Member Henry A. Waxman (D-CA) introduced a bipartisan, bicameral bill that would replace the broken Medicare Sustainable Growth Rate (SGR) formula with an improved payment system that rewards quality, efficiency and innovation. The bill merges the proposals passed overwhelmingly by each committee of jurisdiction last year. "This agreement marks another important milestone in the effort to repeal and replace the flawed SGR formula and provide peace of mind to our seniors that they will continue to have access to the highest quality of care," said House Energy and Commerce Committee Chairman Fred Upton. Repeal the SGR and end the annual threat to seniors’ care, while instituting a 0.5 percent payment update for five years. Incentivize movement to alternative payment models to encourage doctors and providers to focus more on coordination and prevention to improve quality and reduce costs. The Republican House and Senate leadership notified the media that Members of the Congressional Republican leadership, along with Republican leaders of the Appropriations, Finance and Ways and Means Committees, today called on the new Commissioner of the IRS to abandon a proposed rule designed to muzzle the free speech rights of groups critical of the Obama administration. “It is our view that finalizing this proposed rule would make intimidation and harassment of the administration’s political opponents the official policy of the IRS and would allow the Obama Administration to use your agency as a partisan tool. This would be a serious error, especially in light of the recent track record of intimidation at the IRS. It would also cement your reputation as someone who is unable or unwilling to restore the public’s faith in this important agency,” according to the letter addressed to IRS Commissioner John Koskinen. The letter was signed by House Speaker John Boehner, Senate Republican Leader Mitch McConnell, House Majority Leader Eric Cantor, House Majority Whip Kevin McCarthy, House Republican Conference Chair Cathy McMorris Rodgers, Senate Republican Whip John Cornyn, Senate Republican Conference Chairman John Thune, House Ways and Means Chairman Dave Camp, House Appropriations Committee Chairman Hal Rogers, Senate Finance Committee ranking Republican Orrin Hatch and Senate Appropriations Committee ranking Republican Richard Shelby. Referring to the IRS targeting of conservative groups in the run-up to the 2010 and 2012 elections, the lawmakers wrote that the proposed new rule continues the agency’s targeting of First Amendment rights by these same grass-root conservative groups. The top Republican lawmakers wrote that the proposed rule appears calculated to take effect just in time for the mid-term elections, giving a “strong appearance” of political motivation. “One of the reasons you have been appointed to a five-year term is so that you will be protected from undue political pressure. So, we urge you to take a stand against this kind of intimidation, abandon this proposed rule, and make it clear to a nervous public that your agency will no longer engage in government-sanctioned crackdowns on speech,” the lawmakers wrote. Representative Dave Camp has introduced legislation that would prevent the IRS from implementing any such regulation. Sens. McConnell, Flake, Roberts, and others will introduce companion legislation that would do the same thing in the Senate. McConnell noted, "There’s a much easier fix here. The new Commissioner of the IRS, John Koskinen, can put a stop to the rule now if he chooses. And if he means what he said when the Senate confirmed him – the comments we heard about restoring integrity to the IRS – then he’ll do just that." Tags: IRS Commissioner, IRS, proposed rule, gag rule, limiting conservative free speech, free speech, Republican leaders, letter, Medicare Sustainable Growth Rate, SGR, formula doc fix, bipartisan proposal To share or post to your site, click on "Post Link". Please mention / link to the ARRA News Service. and "Like" Facebook Page - Thanks! The Senate is NOT in session today so that each party may hold their party retreats/conferences. Senate Republicans are meeting at the Library of Congress while Senate Democrats have decided to meet at the National Parks building. Tomorrow, the Senate will reconvene at 9:30 AM and resume consideration of S. 1845, the unemployment insurance extension bill. A cloture vote on the Reed amendment to the bill is scheduled for tomorrow at 11 AM. Also possible is a vote on the nomination of Senator Max Baucus (D-MT) to be ambassador to China. Yesterday, the Senate voted 68-32 to adopt the conference report for H.R. 2642, Farm Bill and it was sent to the president for his signature. Later in the day, Senate Majority Leader Harry Reid brought the unemployment insurance bill back to the floor and immediately filled the amendment tree, to block Republicans from offering or voting on any amendments. He then filed cloture to cut off debate on the legislation. H.R. 2954 - To authorize Escambia County, Florida, to convey certain property that was formerly part of Santa Rosa Island National Monument and that was conveyed to Escambia County subject to restrictions on use and reconveyance. H.R. 3964 - To address certain water-related concerns in the Sacramento-San Joaquin Valley, and for other purposes. Rassmussen Reports notes that 60% Think Obamacare Fixes Unlikely Within the Next Year. "Voters continue to be pessimistic when asked if the new national health care law is likely to be fixed anytime soon, but they also remain evenly divided over the impact of the law on their vote in the upcoming elections." As Democrats and the White House try desperately to spin yesterday’s numbers from the CBO confirming what Republicans said all along about Obamacare, that it kills jobs, the Los Angeles Times has a report on the harm Obamacare is doing to ordinary Americans that is even harder for proponents to spin. Tags: CBO, Obamacare, lost jobs, healthcare roadblocks, phantom network, Not working To share or post to your site, click on "Post Link". Please mention / link to the ARRA News Service. and "Like" Facebook Page - Thanks!